Ruby Weekly is a weekly newsletter covering the latest Ruby and Rails news. Are you looking for a Ruby and/or Rails job? 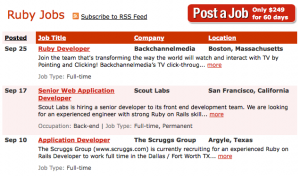 Check out our Ruby and Rails Jobs Board. Want to get your job in as front of as many Rubyists as possible? Since 2008, Ruby Inside (read more about us here) has featured hundreds of job advertisements for companies who need Ruby and Rails developers. We've helped companies like New Relic, Expedia, TechCrunch, The National Events Company, Scribd, AboutUs, and Brightbox look for people to fill their Ruby and Rails positions.